It's never the last chance to get a degree, says PM. Believe him? Is a degree now less useful, or worth less? That’s a question on some people’s minds, following the onslaught of news articles and videos and chatter about the Prime Minister’s National Day Rally speech. “Do not go on a paper chase for qualifications or degrees, especially if they are not relevant, because pathways and opportunities to upgrade and to get better qualifications will remain open throughout your career. “It is never the last chance. His words: It is never the last chance, bear repeating. Far from downplaying the importance of a degree, I think PM Lee is trying to remind Singaporean students and their parents, not to chase a degree for its own sake. Don’t rush to get a degree after school. Work first. Find your passion and skill. Master it. Advance. And there will be some qualification or degree that will be relevant, that improves your skill, and your pay, and your life satisfaction. This of course means that the government, and employers, have to work super hard to make sure these are not empty promises. For one thing, employers have to make sure there are such opportunities for people to advance in skills and qualifications. There must be more applied training and education pathways. Aspire released its report on Monday. 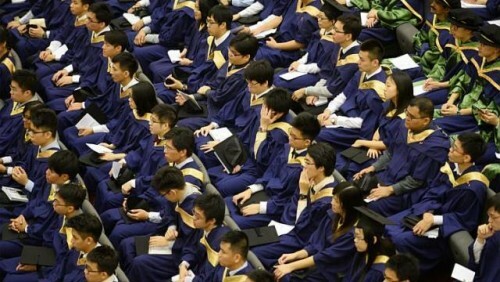 One of its recommendations is to have “place-and-train” programmes that integrate work and study, so polytechnic and ITE graduates can continue to upgrade their skills after they start work. One way of course is to work with individual employers. Aspire also suggested appointing “industry leads” among the polys and ITEs to work with industry partners. This kind of aggregated structure may be more efficient than expecting individual companies to come up with training curricula and standards. How is a small SME in, say, the spa business, to devise training programmes so the receptionist can train to become a master masseuse and then trainer? An industry approach makes a lot more sense. This is the German way. An interesting article by a German professor in The Conversation says Germany’s much-praised apprenticeship scheme doesn’t depend on ad hoc partnerships between employers and training institutions, but is based on a cohesive national plan. At the heart of the system are corporate intermediaries who are given the power to regulate training, and set and enforce standards. They could be chambers of commerce, and trade unions. The writer notes, comparing Germany to the United Kingdom, that such intermediate organisations do not exist in the UK. “At least, there are no organisations with comparable strength in the system. One result is that policies around vocational training in the UK are largely market based. Whereas in Germany, autonomous bodies and committees are often the initiators of vocational policy. I would have liked to hear more from the Aspire committee of what it learnt from its study trips to Germany, Switzerland, Australia and New Zealand. But then strengthening the vocational, or applied, path is going to be a long-haul process. To be fair to the Ministry of Education, it has been engaged on this for decades, since the first vocational training institutes were set up, and polytechnics and ITEs improved. The recent frenzy of activity represents a new phase of this ongoing journey of making workplaces bustling centres of learning and innovation. Critical question: Will students take to this approach?